by Alice Mann. Rowman & Littlefield, 2001. 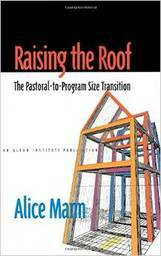 Church leaders facing a prolonged plateau of growth and wondering what to do will find Alice Mann’s book, Raising the Roof, a gift of hope. Mann, at the time a Senior Consultant with the Alban institute and Episcopal priest who pastored six congregations, provides a five-step process to help congregations through what many believe to be the most difficult transition-from a pastoral to program size church. Particularly congregations between 150 and 250 whose growth has leveled out will find wise and practical advice in how to overcome barriers and implement strategies for growth. A unique feature of this book is that it is especially written for a congregational learning team to read, discuss and employ together. Much of the content was developed from an Alban on-line seminar conducted with twelve congregations in transition. From preparing a board and members, to recruiting the learning team and creating and celebrating a plan for congregational learning and action, Mann provides all the resources a congregation needs to address this significant size transition period. This book will provide valuable instruction for any congregational leader of any size or denomination needing to navigate difficult transitions.